Plus, get other bonus features. Read about additional benefits. Learn how you can join IFA to take advantage of this benefit. At what altitude do you need supplemental oxygen so your brain continues to function normally, enabling safe flight? Federal Aviation Regulations suggest that the magic number is 12,500 feet. Between that level and up to 14,000 feet, according to the FARs, crew members must have supplemental oxygen if a flight lasts longer than 30 minutes. But in practice, the highest safe altitude without extra oxygen may be much lower than that — as low as 8,000 feet, studies show. Even the Federal Aviation Administration encourages pilots to use supplemental oxygen above 10,000 feet during the day and above 5,000 feet at night, when thin air can compromise vision. Learn more. 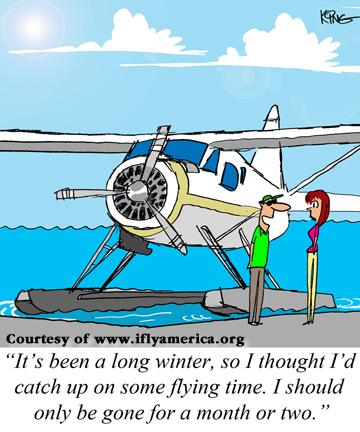 Some things about flying are just fun to know; others are necessary when taking biennial flight reviews or other tests. On your next biennial, throw some of these questions at your instructor. 1. What is the origin of the term "dead reckoning"? a. Straight navigation, so the compass is "dead"
c. From term "Direction Estimates And Distance"
2. Cal Rogers was the first person to fly an airplane coast to coast. For what other first is he known? Click here to continue the quiz.